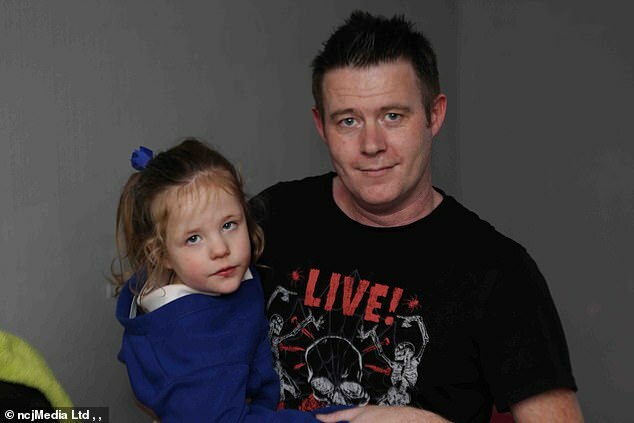 A father has told of his horror after watching his ‘bubbly’ daughter lose her ability to walk and talk to a cruel disease. Penny Stewart, from Blyth in Northumberland, was just two years old when she was robbed of her movement and speech. Doctors diagnosed Penny with Rett syndrome, a life-limiting condition which affects the development of the brain after two years of tests. Describing the reality of the condition, her 40-year-old father, Ben, said: ‘It’s horrible to watch. Mr Stewart and Kay Douglas, Penny’s mother, have both given up work to become their daughter’s full-time carers. Penny, now four, had developed normally and ‘would love nothing more’ than to be outside, shouting and running about before she started to regress. In a dramatic turn of events, Penny seemingly lost the ability to talk and use her hands overnight. And a year later she lost the ability to walk. Doctors finally diagnosed Penny with Rett syndrome after two years of thorough medical investigations. The genetic disorder caused by a mutation is currently incurable. Many sufferers die prematurely due to complications, including epilepsy. Rett, which has four stages, strikes one in 12,000 girls born every year, according to estimates. It is rarely seen in males. 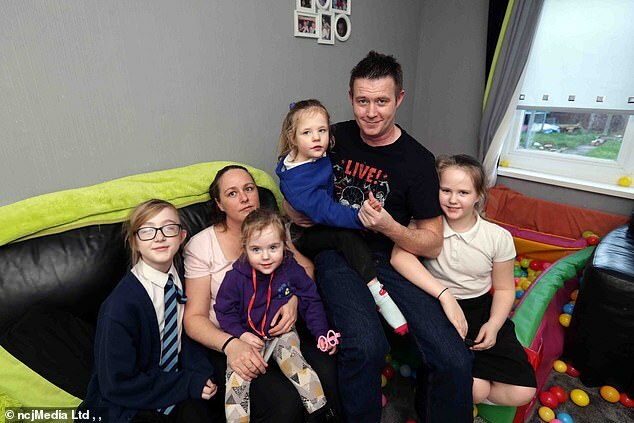 Penny has been left with a ‘lifetime of struggles, seizures and surgeries’ because of the condition. Mr Stewart said: ‘One of the big changes you have to make, as a parent, is altering your expectations. ‘With other diseases you get treatment and you look for improvement, even if it’s gradual. He added: ‘It’s just so cruel in the manner that it works. ‘Often you could reach three, your child could have 40 or 50 words, be starting to string sentences together, they can walk, and then they lose that. Penny’s bubbly personality and ‘infectious laugh’ keeps Mr Stewart going. He balances caring for Penny and his two eldest daughters, Paige and Poppy, alongside tirelessly fundraising for research into her condition. Reverse Rett, a UK-based charity, claims there is a realistic possibility of effective treatments and even a cure within decades. Mr Stewart revealed its this hope that drives him to take part in difficult challenges to raise money into research of the cruel disease. He plans to run 500 miles over the year, as well as take part in 10km runs in his bright purple ‘Rettman’ superhero costume. Mr Stewart has already had his legs waxed and took part in a boxing day dip, all to raise money for Reverse Rett’s research. He has already raised more than £1,000, and has pledged to complete a series of forfeits, including dressing up as a unicorn, for every £500 raised. The flamboyant costumes and public displays are a challenge for Mr Stewart, who is normally shy. But the thought of finding a cure for his daughter drives him on. He said: ‘I certainly believe that a cure is possible within her lifetime. ‘My opinion is within the next few years we will see more pharmaceuticals. ‘Then gene therapies, which are being worked on at the moment, will take more like 10 or 15 years to start to become available. 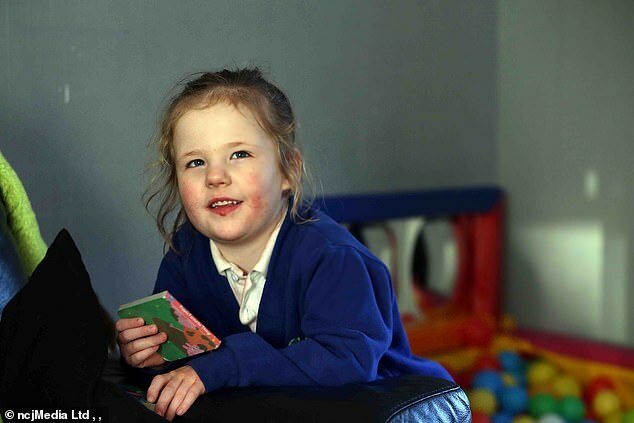 ‘If I didn’t believe research offered a realistic hope I wouldn’t be doing this, but I believe this is the best course of action for children like Penny. One child in 12,000 is born with Rett Syndrome, yet few people have heard of it. The genetic disorder affects almost exclusively females, causing them to regress neurologically and physically. The progression of the disease can be roughly divided into four stages. During the first stage, from about the age of six to 18 months, a baby slows in development, loses interest in play, stops making eye contact, starts walking awkwardly and makes repetitive hand movements. The second stage, known as ‘rapid destruction’, begins between the ages of one and four. The child finds it increasingly difficult to communicate and learn and there is often a deterioration in other brain functions. Symptoms include an inability to control the hands, sudden distress teamed with screaming, unsteadiness, breathing problems, difficulty sleeping, slow head growth and digestive problems. The third stage, the ‘plateau’, begins between age three and ten. Limbs become floppy, epilepsy may develop and there may be weight loss and teeth-grinding. However, many parents say children are less distressed and show more interest in their surroundings. The final stage can last for decades. Usually severe bending of the spine – scoliosis – develops, as well as losing the ability to walk. Almost all cases are caused by a mutation in the MECP2 gene which prevents nerve cells in the brain from working properly. Currently there is no cure and only the symptoms are treated. Sufferers can live to their 40s but most die before 25.